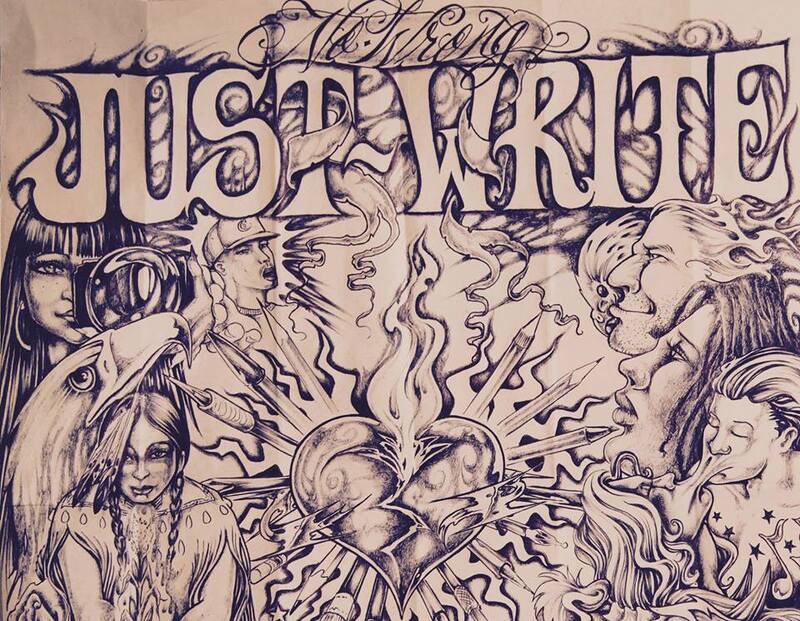 JustWrite has partnered with Southwest Indian Polytechnic Institute this past semester for a write and art exchange which will culminate in a night of poetry and digital storytelling. Please joins us Monday April 15 from 5-7pm on SIPI campus for this event. 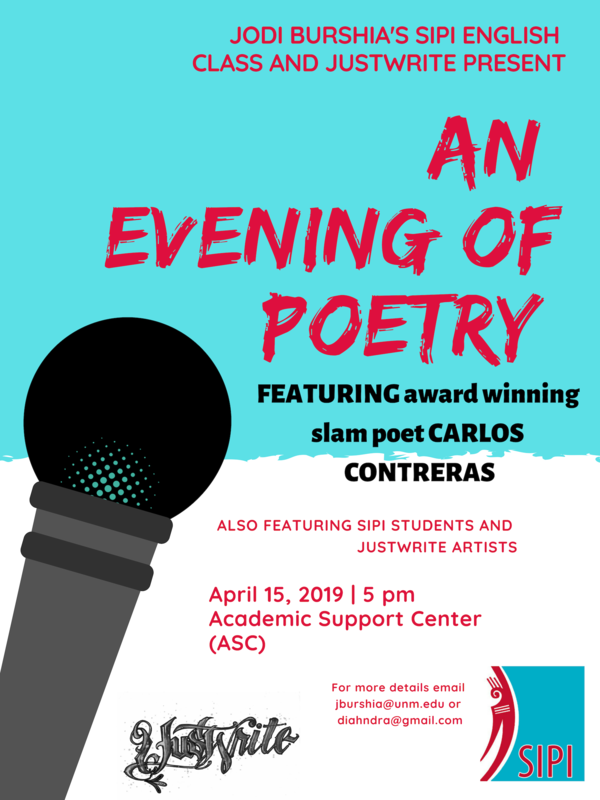 SIPI students will present their digital stories, poetry will be read and performances projected from JustWrite artists and poets, and our featured poet Carlos Contreras will facilitate a poetry workshop and perform his own poetry. We’ll have different soups to share for the evening. Come join in and share your story! JustWrite will be posted up outside The Boiler Monkey from 6 to 9pm downtown Albuquerque tonight 10/5 for First Friday Artwalk. ABQ Artwork is a collaboration between downtown businesses, venues, and artists. We hope to see you there! JustWrite will be tabling at the Albuquerque Zine Fest Saturday, October 6 from 11-6pm at Three Sisters Kitchen in downtown Albuquerque, 102 Gold Ave SW. We’ll be releasing our latest zine created by the gente of JustWrite inside the Bernalillo County Detention Center in collaboration with Southwest Indian Polytechnic Institute (SIPI) students, in partnership with Jodi Burshia. Catch us this Saturday and get a copy of our new zine; we’ll have all previous volumes on hand as well. We can’t wait to see you there! 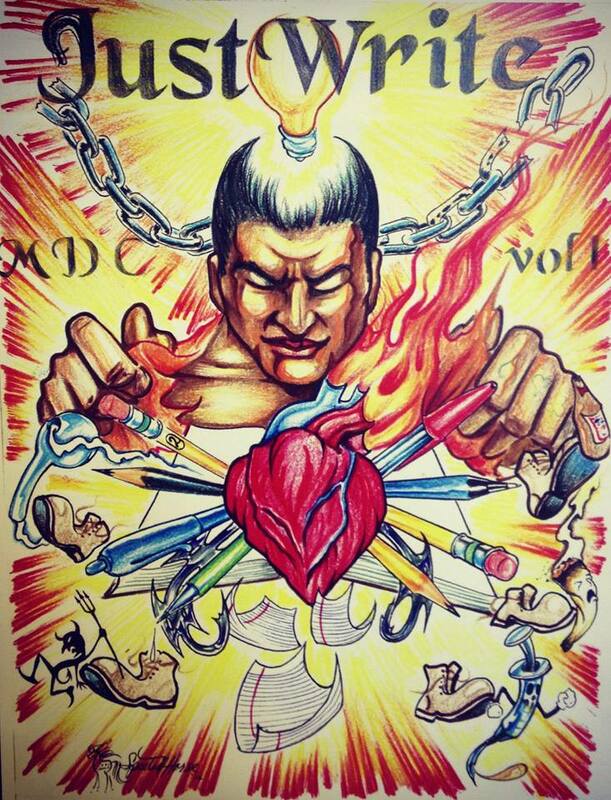 Zine cover art by Acoma aka Tristin Routzen. JustWrite is partnering with Southwestern Indian Polytechnic Institute (SIPI) and Two Way Street for a write exchange in 2018. Jodi Burshia (Laguna Pueblo, Diné, Hunkpapa Lakota) is a faculty at SIPI and will engage her English class in a the write exchange. Two Way Street will also participate in this exchange. This exchange will culminate in a reading/performance on Thursday August 9, 2018, 5-7pm in the Academic Support Center on SIPI campus. Diahndra of JustWrite is facilitating writing and visual art workshops at the Albuquerque Metropolitan Detention Center currently. 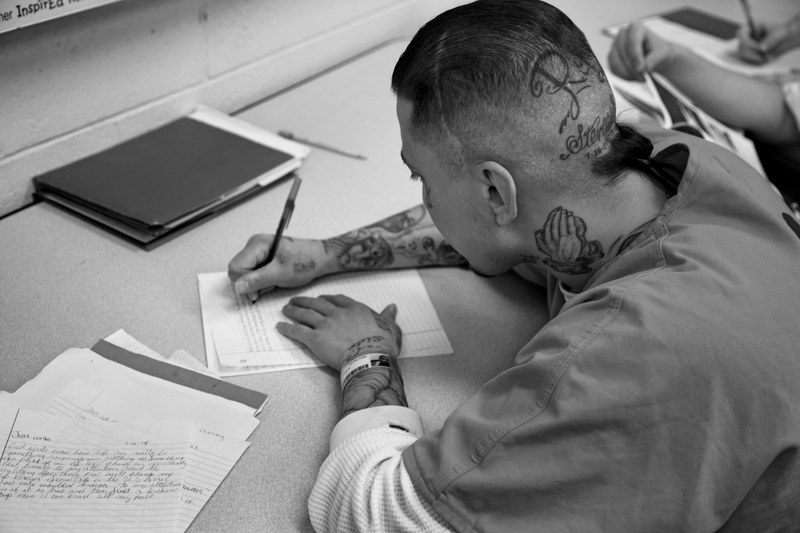 JustWrite also engages those incarcerated through postal mail across the state of Nuevo Mexico. Visit us here on our website, nowrongjustwrite.org, for updates and to see this exchange come to life. You can find this exchange and new poetry each week from these writers under “Write” or here. JustWrite will be tabling at the Albuquerque Zine Fest October 9, 2017 at The Tannex from 11-6pm. Come out and meet some of our artists, and check out our zines created in prisons and youth detention centers where we’ve facilitated visual and literary arts workshops. These are one of a kind zines with original artwork. The decolonial love issue promotes human awareness beyond the bars of the carceral system. As artists we ask questions like – where does our greatest growth occur? How does learning take place? Where can we share those lessons learned? In a society in which we maintain oppression and inequalities through the use of punishment andviolence, we are in urgent need of transformation and enlightenment. Stark truths beckon us to hear, acknowledge and respond. As/Us is our response to that urgent need. The journal started with a mission to create more spaces in the world for voices to be shared. We ask: how can we create community that translates off the page? How do stories guide others through their humanity and into decolonial love? This issue features writers exploring the theme of decolonial love. Some contributions were selected from our open call for submission while others were selected by the co-creators of Just Write (an organization that works with underserved communities in the education sector and those who are incarcerated) and Tria Andrews, who worked with writers from Prison University Project at San Quentin State Prison. Our session will involve a brief overview of teaching experiences within the carceral system and the choice to interweave pieces by those who are incarcerated and those who aren’t to address power hierarchies. In this publication, a common thread of humanity weaves its way through themes of addiction, incarceration, domestic and state violence, poverty, hope, love, despair, loss, healing, and survival – all written inside the walls of prisons, some finding their way to us from the depths of solitary confinement. JustWrite is hosting a workshops series involving creating and collaborating around our experiences of incarceration, addiction, state, and domestic violence. We’ve been working toward the Social Justice Exhibit in partnership with The Harwood Art Center, open for viewing for the whole month of September. Please join us this Thursday 9/3 at 6pm at The Harwood. Diahndra Grill and Carlos Contreras of JustWrite partner with Harwood Arts Center to host an interactive multimedia exhibit featuring artists in transition and community members who have shared experiences of incarceration, addiction, state, and domestic violence. This exhibit is a visual/visceral experience that illustrates how art in community can bridge previously disconnected populations.